The week long Orientation Programme at Asian Business School, Noida for the 2018-20 batch of Post Graduate Diploma in Management (PGDM) started with the Chief Guest, H. E. Désiré Kumba (Ambassador, Republic of Gabon) exhorting the students to dream big in life and working hard to achieve those dreams. The PGDM orientation programme at ABS also witnessed the release of the latest issue of International Journal of Management by the president and the guests. The objective of this journal is to disseminate concepts of professionalmanagement and contribute to a better understanding of the context, resources, structures, systems, processes, and performance of organizations. The Research and Development (R&D) Cell at Asian Business School has been working relentlessly towards developing ABS into a centre of excellence in management research and education. Various activities being organized by the R&D Cell include FDPs, National Seminars, International Conferences, MDPs and publication of Journals. Through these multifarious activities, ABS tries to create an avenue for development and sharing of various managementrelated ideas, concepts and applications. The Research and Development (R&D) Cell operates with a twin fold objective. The first aim is to create an environment conducive for development of research aptitude and skills among the faculty and students, and facilitate research through infrastructural and procedural support. Secondly, the R&D Cell aims at working closely with industry for developing better processes, systems or services which result in productivity growth and encourage interaction between academia, industry and government. ABS International Journal of Management is an initiative of R&D Cell of Asian Business School in the direction of knowledge dissemination and research application. It is a bi-annual publication and accepts papers after a thorough peer-review process. The journal contains research papers as well as case studies. For this, articles are invited from academicians, practicing managers, professionals, research scholars, and students engaged in research. The journal is highly appreciated in corporate and academics where it is circulated. The recent issue of the journal which is the 6th Vol. (Issue 1) was released during the Orientation Program of PGDM 2018-20 Batch held on 2nd July 2018. 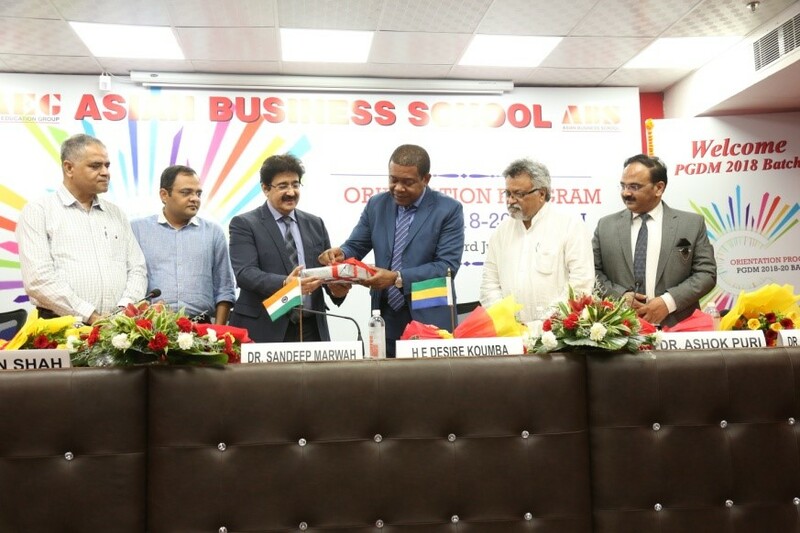 Thejournal was released by Prof. Sandeep Marwah (President, Asian Education Group) and the chief guest of the event H. E. Désiré Kumba (Ambassador, Republic of Gabon) in the presence of dignitaries Dr. Ashok Puri (Founder & Managing Director Lean India Consulting Group) Mr. Manan Shah (Director – Marketing, TrueCaller) Mr. Abhay Kapoor (Lead – HR India Operations Amazon.com) and Dr. Lalitya Vir Srivastava (Director, Asian Education Group).